Getting to zero takes might, takes diligence and above all, it takes a hero! The challenge is lofty, but the rules are simple. 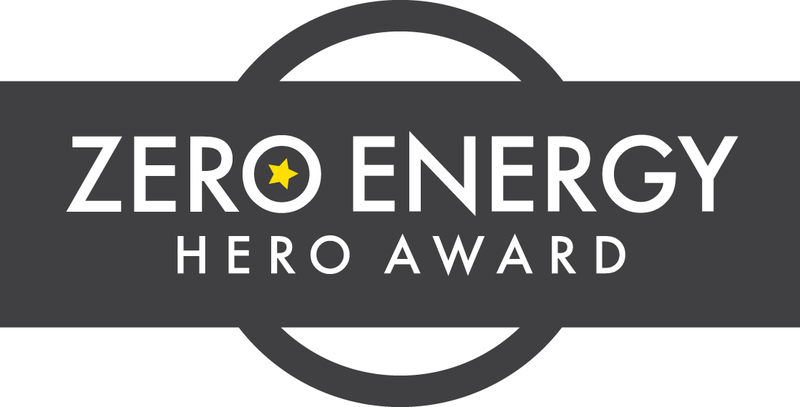 A family or building owner who can achieve zero energy usage on their utility bills from on-site renewable energy usage can win a yearly award. Contact us to apply today – rules are below. If you are starting a project no, make sure to make sure to follow our Zero Energy Capable program so that you can easily achieve this award with little effort. What all do I need to submit? Amount of material burned if wood, coal or other fuel was used. Does this award ensure my project is certified? No. It is just a snapshot of 1 year in time, based on utility bills. See our Zero Energy Capable Certification to get certified. How do I know if I am zero energy? (Biofuel, wood and/or coal must all be calculated as well). Subtract fuel usage from Kilowatt Hours generated on site. What counts as on site energy generation? *Still determining definition but we will know it when we see it. ** Solar Hot water cannot offset electricity usage only heating water. What about Zero Water Hero? You must produce as much water as you consume through rainwater catchment and/or groundwater. The groundwater must be replaced at the same rate it is taken out and not in a way that reduces the quality.